OUR EXCLUSIVE INTERVIEW WITH STEVE HICKS, UPON SIENA INVESTMENTS' SELECTION AS A TOP 150 FIRM IN THE UNITED STATES, CONDUCTED BY COURTNEY MILLER OF ARROW MEDIA. Q. Good Morning, Mr. Hicks. 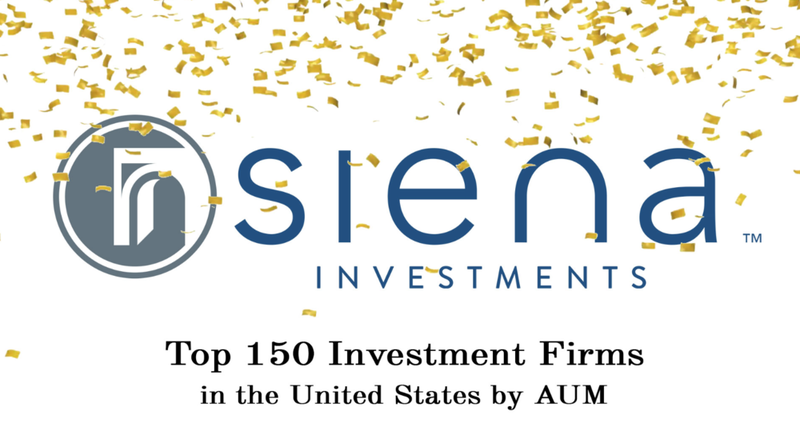 So, when you and Mr. Millbrook started Siena Investments approximately 15 years ago, did you ever imagine that your firm would be recognized as one of the top 150 CPA Investment firms in the United States? A. I did not, actually. I have a very successful uncle who always told me that there are plenty of lawyers and doctors out there (actually over a million in each profession today) but only few are recognized in their communities as the cream of the crop. He was correct, as I either know of or know those professionals who are the best in Mid-Michigan. They are a select few, that’s for sure. I was just hoping to be so recognized in our community. What I never imagined is that we would be recognized as one of the top firms in the entire country, with clients spread throughout many states and Canada. That is beyond any professional’s wildest expectations. We are truly fortunate. Q. I’m going to ask you in a moment how you got to be one of the best investment firms in the United States but, first, can you tell me of a turning point that has driven your success? A. The stock market crash of 2007 and the few years thereafter. That was a significant turning point for our firm. Let’s just say that we are battle tested. We saw many of our competitors either go out of business or get merged out of existence. Meanwhile, our firm continued to grow because when the (economic) world goes to hell in a hand basket there is an inevitable flight to quality for those investors who now want only the most qualified advisors. I’m a sailor and I often think in terms of boating. If you are out at sea and it's smooth sailing anyone can be at the helm. In a storm with rough seas when you are taking on water, however, will just any captain suffice? Q. I completely agree with you. What are some of your guiding principles that sets your firm apart from just about every other investment firm in the United States? I mean there are only 149 other firms so recognized in the nation. A. We place the client first not only in our words and marketing campaigns, I mean anyone can say that, but with Siena Investments it is part of our DNA. The systems that we have in place, along with the very contracts that all clients sign require that we put the client first. Let me give you just a few examples. We are fiduciaries to all of our clients and have been since day one. A fiduciary duty is the highest duty in the law. Like a lawyer to a client, or a physician to a patient. We accept no commissions, never have. A commission creates conflicts of interest. The advisor gets paid by the mutual fund company or insurance company at a varying percentage based upon what the client buys. That’s like going to a doctor who prescribes you medication where he receives a commission from the pharmaceutical company. How would you feel if you learned that your doctor chose your prescription, in no small part, because it provided him with the biggest possible paycheck? Let’s just say that you would feel compromised in your health care. I speak in understatements here. Q. You have offices in multiple locations, and you are growing very nicely, where do you think that you’ll head next? Q. You have many clients out of state, even in Canada, do you ever see Siena Investments having offices outside of Michigan? A. Yes, probably Chicago and southern Florida perhaps near Ft. Lauderdale or Palm Beach. A. It is extremely rare and humbling, indeed. It is true that our advisors have substantial education, graduating from top national universities, combined with robust experience. It is also true that we operate in the lower cost wholesale markets and not the more expensive retail markets. It is beyond all that though. Our approach to investing is evidence-based. We look to the literature in the field to make sense of the research data. Just as there are no commissions with Siena, we also have no sales office. We are not simply selling a prepackaged product for a commission or a fee. Instead, we are like a graduate school and approach investment selection as a rigorous science. The best analogy that I can give is the Mayo Clinic. The Mayo Clinic is to personal healthcare as we are to financial health. They utilize a multidisciplinary approach to the practice of medicine wherein teams of experts from different specialties work on every case. Unlike most hospitals, it is a holistic and integrated approach to medicine. We have always sought to be the Mayo Clinic of investment firms. At Siena, we have MBAs, CPAs, CFAs, and lawyers who are prepared to create an integrated investment, retirement, tax, and estate plan for our clients. I know of no other firm similarly situated. I can summarize my thoughts on building an excellent firm from a client’s perspective with a simple question: Why would an investor want to pay more elsewhere and receive far less?